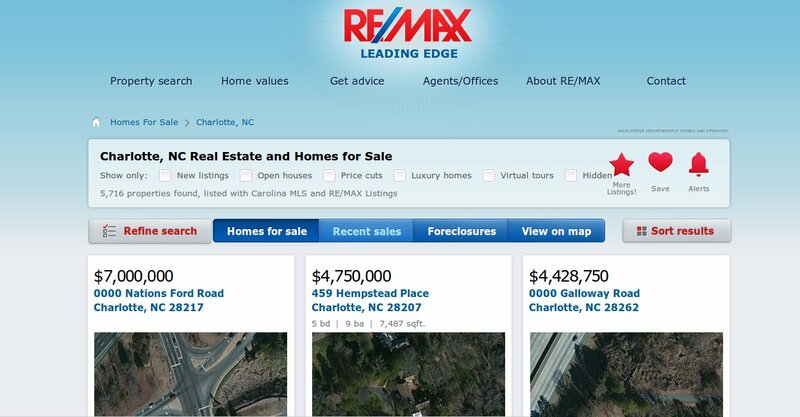 Setting aside Zillow, Realtor.com, and other such sites, we take a look at top five real estate firms listed in Google for Charlotte, North Carolina, to see what they have to offer those interested in buying property in the city. The first thing you see when you arrive on Savvy and Co.’s website is a live chat box and a welcome from someone named Paulina. Now, depending upon how open you are to immediately dive off into asking for help, this may or may not be off-putting. Even so, you have to give credit to Savvy and Co. for taking advantage of the opportunity to engage visitors right away. Setting aside the fact that there are a couple of immediately noticeable grammar errors on their rotating banner, Savvy and Co. has done a good job of designing an in-depth website that hits all of the highs. They offer information about relocating to Charlotte, provide insider information on local neighborhoods, and even provide an interactive map that allows visitors to explore Charlotte according to those neighborhoods. Savvy and Co. has also clearly done their homework and invested in social media. From their website, you can follow them on Pinterest and Instagram. Their website even proclaims, “We’re a Tech-Savvy group and we love what we do. Check us out on the other parts of the web.” Twitter, Facebook, YouTube, LinkedIn, Google+, Instagram, and Pinterest—they have all of their digital bases covered. 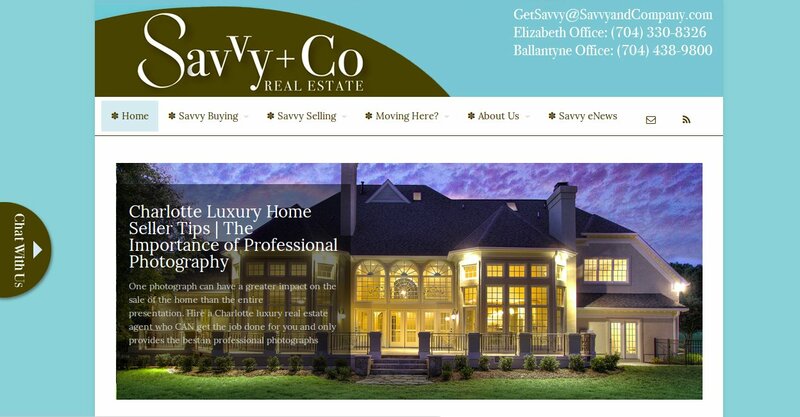 Savvy and Co. also has an e-newsletter and a RSS. The biggest advantage that this realtor has going for it is the fact that it is associated with a big name company. Still, that appears to be enough to get them on the top page of search engine results for Google. Due to the fact that this is a franchised real estate agency, the website is similar to what you will see with other RE/Max sites. They place featured listings front and center. Re/Max does offer a blog, but you would need to scroll down to the end of the website to even know that it is available. They also participate in a range of social media platforms, including Facebook, Twitter, Google+, YouTube, Pinterest, and LinkedIn. Once again, visitors will only know that they can engage the site on various social media networks if they scroll to the end of the site. Coldwell Banker Classic also has the advantage of a big name. This firm participates in a range of social media platforms and places opportunities to engage on those networks front and center. Among those social media platforms include Facebook, Google+, YouTube, Twitter, and Pinterest. Additionally, they have a blog, which they also promote. 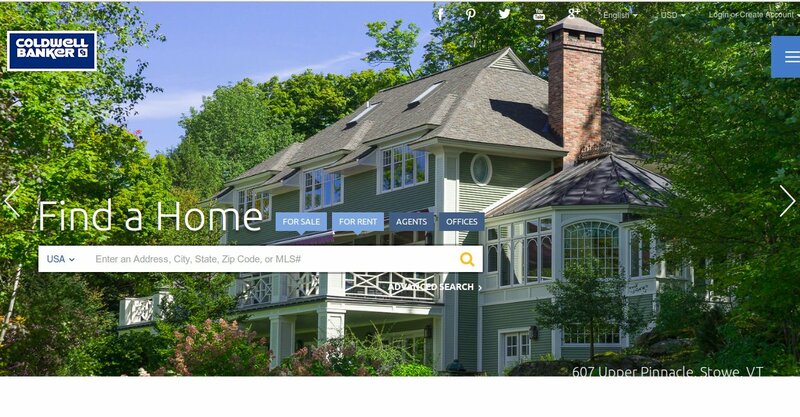 One of the best elements that sets this real estate agency apart from others is the fact that they provide a general overview of Charlotte directly on the first page of their website. Visitors can also take advantage of a wealth of other information while planning a move to Charlotte, including demographics and information about schools in Charlotte. Dickens Mitchener has been in business for more than 20 years. Intimate knowledge of the local market shows from the first page of this agency’s website. In fact, the sheer volume of information available on this information shows that this agency has spent some time ensuring that every area is covered. Whether you are a buyer, seller, or just a window shopper, you will find what you are looking for here. A monthly snapshot on the first page gives buyers and sellers a solid idea of what to expect from the current market. Information is also provided about neighborhoods in Charlotte. Along with providing information about listings, this real estate agency also provides video walkthroughs, an innovative touch that can help to save buyers a lot of time. 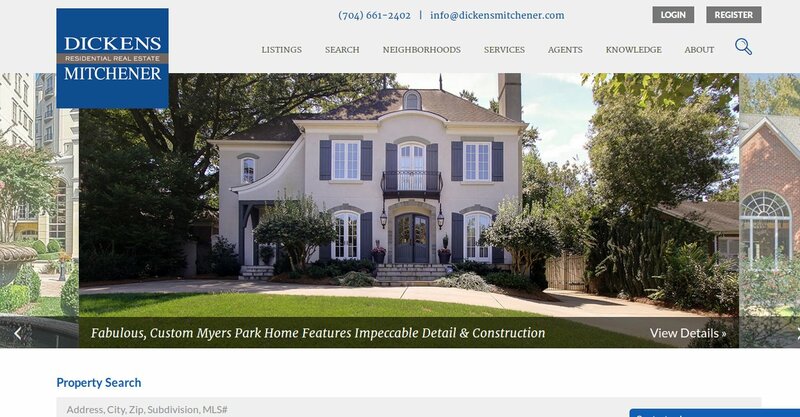 Like other local real estate agencies, Dickens Mitchener has tapped into social media and is active on Facebook, Twitter, Instagram, YouTube, LinkedIn, Pinterest, and Google+. They also offer a blog for keeping clients updated. If there is any surprise regarding this agency, it is that they are not listed higher on the search engine results. Henderson Properties is rather unique in that they seem to be a jack-of-all trades. Along with offering real estate sales, this firm also provides Property Management and HOA Management. The firm has been in business since 1990. 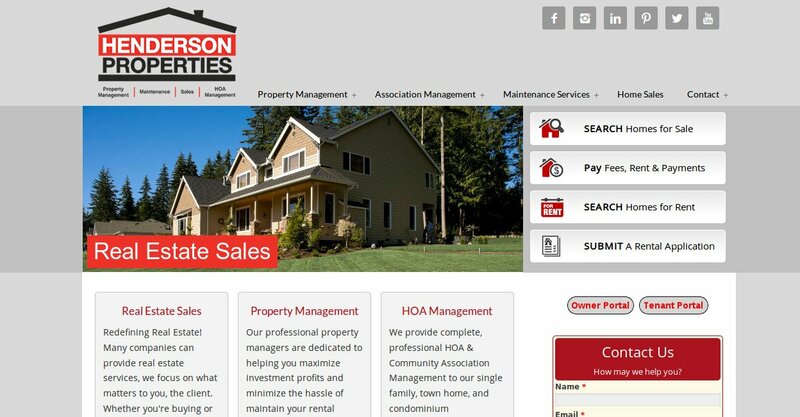 While other real estate agencies in the Charlotte area offer a sleek website, Henderson Properties’ website is much more down-to-earth. This could serve to make it easier for consumers who may not yet be ready to buy a home and who are instead looking to take advantage of the firm’s rental property services. Henderson Properties is active on social media, including Instagram, Google+, Facebook, Twitter, LinkedIn, Pinterest, and YouTube. They also have a blog.